The Toyota 4Runner has evolved from being a simple capped pickup to a premium mid-sized SUV; from being moderately underpowered, to having more power than many competitors. The four wheel drive system has gone from being labor-intensive to turn-a-dial easy, while the interior has gotten cushier and quieter. Standard features include hill ascent and hill descent control, a five-speed automatic transmission, antilock brakes, traction control, and air conditioning, which may be why the SR5, once reserved for feature-filled Toyotas, is the base model 4Runner. The base engine is a torque-happy but loud V6 producing 245 horsepower from four liters, with four valves per cylinder and variable valve timing. The V6 has lots of torque for instant reactions, and under heavy acceleration, sounds like a sports-car engine; the flat power curve and well-tuned automatic transmission keep drivers from running out of steam. Movement is quick whether the foot is down just a little or all the way. The transmission is smooth but quick and responsive, and the gated shifter provides access to every gear. The only downside to this combination is rather poor gas mileage. The V6 power beats the Jeep Grand Cherokee’s V8 engine; though the optional Toyota V8 produces 270 horsepower (with 330 lb-ft of torque), the Jeep’s optional 5.7 V8 outstrips it with 345 horsepower. Driving the V6, we tended to get about 16 mpg city, 21 highway, which is close to EPA estimates. The sophisticated four wheel drive system uses a simple knob; simply moving forward a few feet or unlocks the differential. The advanced Torsen-type locking center differential has its own control. 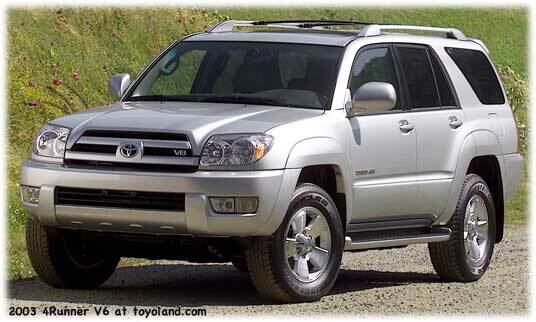 The 4Runner also uses an independent front suspension, which is better on-road and set up to do well off-road as well. Push and turn further to go into low gear, though low-gear four wheel drive is accompanies by a rather annoying beep (the same one used on stick-shift Tacomas to indicate that you're in reverse). 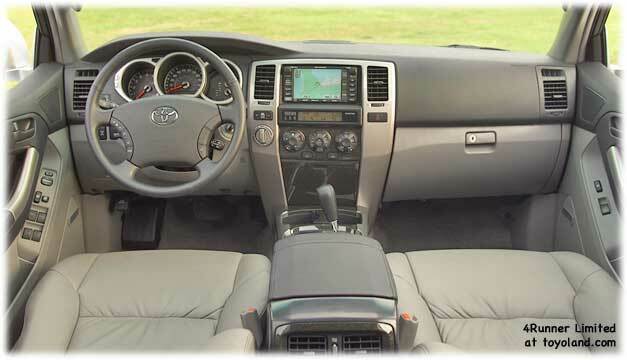 For serious off-roaders, Toyota's descent mode and the ability to shut off the side curtain airbags (which could accidentally be activated on a steep angle) are probably very welcome; the side airbag shutoff requires an extended push to activate or deactivate, which isn't especially intuitive. But, then again, everyone reads the owner's manual thoroughly, right? The stability control system worked well, kicking in to prevent problems and making it easy to take hard turns without squeals or danger, though of course relying on it to do this would not be a good idea. The 4Runner is designed to go off-road and on-road both, but off-road capability carries with it some limitations - a higher center of gravity, mainly. Handling feel is not bad for this type of vehicle, with the usual body lean and such, but car-based SUVs are likely to feel better. The ride is well cushioned for minor road-surface problems, but more serious potholes, bumps, and the like make themselves felt with bounces, jiggles, and moderately cushioned shocks and bumps. The brakes are strong but it was hard to make them feel smooth. Visibility is generally good, though with the side-facing rear seats up, the seat and headrest conspire to block the rear quarter window (which, incidentally, has an electric defroster - a clever touch which would make it easy to see through in winter if the seat and headrest didn't block it). The large outside mirrors are quite handy and fold in for tight spaces, and the headlights are bright and well focused, a Toyota trademark. Because the sill line is low, you can see down to either side better than in most SUVs; the rear window is also unusually large for good back visibility. The front seats in our SR5 model included a manual height pump and an electric lumbar adjustment, but we were unable to find a comfortable position; of course, car seats are highly subjective, and you may find them to be perfect. The rear seats are a bit low. The interior is nicely styled for the most part, but we found some parts looked or felt cheap, including the annoying catch on the overhead sunglass bin. Interior lighting is good and bright, with push-to-activate lights for driver and passenger, and a standard, sensible on-light switch for the dome light. A trip computer is built into the center console, providing distance-to-empty, average gas mileage - which you may want to avoid knowing about - and the outside temparature and average speed. The system is easy to figure out and reset, but we did wish for a compass in there as well. A warning light tells of overheating in the transmission if it ever happens. Bins and cubbies include a clever pair of size-adjustable cupholders up front (rear passengers' cupholders fold out of the center console), map pockets on all four doors and on the backs of the front seats, a little ashtray-style bin that folds out of the center stack and another exposed one by the center console, the actual ashtray next to the gearshift, an overhead sunglass bin, and, finally, a two-piece covered bin in the center console, with one small folding space and another rather generous with a removable coin tray (sorry, no room for pennies). Some storage areas have a rubberized bottom, some don't. The climate control has a somewhat gimmicky appearance with gear-like "knobs" that turn out to be overstyled pushbuttons. That said, the system's workings are fairly clear, and the air conditioner compressor has a separate on/off control for flexibility and convenience. The standard automatic, thermostatic controls worked well. The stereo was also simple to use, with both a cassette and CD player in our test car, but we found it hard to get the bass down to talk-radio level, and audio is controlled by the less-convenient "push a button, then turn it" system. At speed, substantial wind noise interferes with the sound quality. The instrument panel includes a large, easy to read speedometer, odometer, temparature gauge, and gas gauge, which are always backlit in an orange-amber color, which keeps visibility good under all light conditions. When the headlights are on, a headlights-on indicator lights up, presumably because of the always-on backlighting. Controls are generally logical, though many options are controlled from a series of pushbuttons whose indicators are not in consistent locations, and our not-quite-optioned-out model had a number of blank inserts where buttons would normally be. If you really were looking for quirks, though, look no further than the gas cap release - we had to look quite a while to find that. It turns out to be a barely-marked lever underneath the dashboard, nearly impossible to see while actually in the truck, and located right next to the equally-poorly-marked hood release. The normal way to pop the gas cap, then, is most likely feeling around the bottom of the dashboard, then making sure the hood release latch is still to the right. Or asking the attendant to check your oil when you pop the hood by mistake. 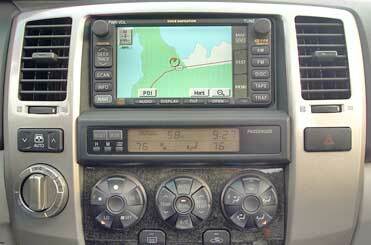 Overall, the control layout doesn't seem as well thought out as we would expect on a Toyota. The offroad controls are split between the left and right dashboard and the central console, the gas cap and hood release are far too close together, and the rear window control isn't near either one. Some models include a tilt/telescoping steering column; ours had a relatively inflexible variety, with large gaps between positions, but it did have a good range, allowing for tall drivers. It also had a dead pedal. Interior space is plentiful for four, with good storage space as well. Use the rear jump seats and you can fit six; put three into the middle seat, and the 4Runner can hold seven, which is good for a mid-sized SUV. But the people in those last two seats had better be pretty short, and it takes some doing to get the seats down (or firmly stow them). The middle row of seats are far easier to fold down, and you don't even have to take the headrests out. The capacious cargo area has various ways to keep cargo down, including ties, nets, and cubbies. A double-deck cargo shelf, similar to that of the PT Cruiser and Liberty, folds up from the floor (it's not available on all models). The rear hatch window goes up or down at a command from a big switch up front, or can be moved down via the key fob and back up again by holding the key in the lock, so you can toss things in without bothering to open the rear. The 4Runner SR5 - the base model - comes complete with a limited slip differential traction control, four-wheel antilock disc brakes, hill ascent control, an antiskid system (traction control and stability control), thermostat-controlled air conditioning, high-quality cloth upholstery, power mirrors, windows, and locks, remote keyless entry, CD/cassette, tachometer, variable wipers, rear defogger, rear wiper-washer, antitheft alarm, fog lights, skid plates for off-roading, hitch, and full-sized spare. All that comes with a base price of just over $28,000, including destination, making it much more attractive than the oddly popular Ford Explorer - especially given the Toyota's resale-value and reliability advantages. Our test car had a few options - four wheel drive, the third row seats (see them beforeyou buy them - seriously!) at $735, curtain and side airbags at $680, roof rack ($220), and floor and cargo mats ($186, believe it or not). The grand total ended up at $32,156 with destination. We really enjoyed the 4Runner's sprightly V6, and look forward to testing the V8 next year. The 4Runner outclasses the top-selling Ford Explorer by a good margin, and, unlike the Explorer, can go off-road with confidence. The 4Runner's drivetrain is very sweet, and the off-road ability is reportedly quite good; but those who don't actually go off-road will do better with a far more economical minivan which will get better mileage and cost less for similar features. Likewise, a raft of all-wheel-drive equipped tall wagons, from the Outback to the XC70, are competing for your attention. But for the true off-roader who wants on-road comfort and reliability, the 4Runner is a leading contender.